March may look a whole lot like February, but cozier tidings are in store! 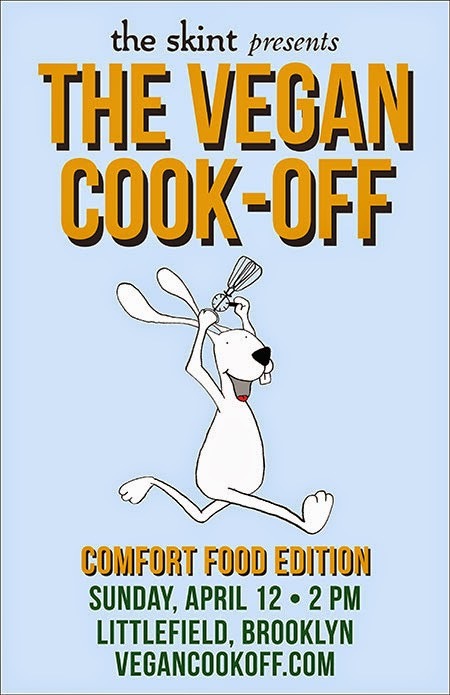 Join us at Littlefield on Sunday, April 12 and indulge in (non)creature comforts at this year’s spring vegan cook-off! We’ve brought you desserts, hors d’oeuvres and the best balls at our previous cook-offs. This season, more than a dozen everyday chefs will vie for your votes with vegan comfort food: everything from hearty mains, to palate-pleasing snacks, and even decadent desserts. In addition to the nom-worthy fare, vegan wine, beer and liquor will be available for purchase to wet your whistle. And calling all cooks! We want you to make us feel warm and fuzzy inside. Do you whip up the best non-dairy mashed potatoes ever? Do your homemade donuts rival Dun-Well? Show us your culinary chops and apply here to be one of our cook-off contenders by April 3. Any recipe that brings you comfort is eligible. First place gets a $250 cash prize! Shake off the winter doldrums—get your ticket to deliciousness today for $12 in advance, $15 at the door. We’ve sold out of tickets to all our previous cook-offs, so don’t wait! SOLD OUT - NO ADDITIONAL TICKETS WILL BE AVAILABLE AT THE DOOR. It’s been a while, but we’re finally back with another delicious vegan cooking competition! Once again we’re ditching the utensils all together and digging in with our hands: Get ready for the NYC Vegan Cook-Off: Best Balls Competition! Mock meatballs, rice balls, risotto, matzo, cake pops, truffles, energy balls, popcorn and beyond… anything ball-shaped is fair game— as long as it's vegan. Head to Littlefield on Sunday, August 3 for the skint’s Vegan Cook-Off: Best Balls Competition. The event is open to 12-15 everyday chefs who’ve got the goods to compete for the title of The Bestest, as voted for by judges and attendees. $250 cash for first place! Aspiring competitors should check the rules for details on how to apply. But if you just want to be fed and socialize with other veggie folks, tickets for The Vegan Cook-Off are $15. (We’ve raised the price slightly from last time because we’re limiting ticket sales by almost half in order to have a more manageable experience for all and to give the chefs a bit of a lighter load.) And to wash down all the cruelty-free deliciousness, we'll be providing a list of vegan-friendly beer, wine, and liquor available for purchase at the venue. Tickets for our last two cook-offs sold out, so we recommend purchasing in advance to avoid missing out! Tickets to eat and vote (includes a free raffle ticket) are $15 in advance, $18 at the door. SOLD OUT: A SMALL NUMBER OF $15 STANDBY TICKETS (ABOUT 10) WILL BE AVAILABLE AT THE BOX OFFICE WHEN IT OPENS AROUND 1PM SUNDAY. The NYC Vegan Bake-Off Dessert Competition in February was such a delicious success, and made us feel so warm and fuzzy (and like we needed a nap after our sugar crash), that we’ve put together another scrumptious vegan cooking competition. This time around we’re ditching the utensils all together and digging in with our hands: Get your gullets ready for cruelty-free finger-lickin’ appetizers at the NYC Vegan Cook-Off: Hors d'Oeuvres Competition! Whether you’re into traditional bar food bites — a la fabulously seasoned french fries or not-pigs-in-a-blanket — amuse-bouches that aim to please in their all-natural vegan glory, or want to go all-out with surprising savory snack creations, head to The Bell House on Sunday, June 2 for the skint’s Vegan Cook-Off: Hors d'Oeuvres Competition. The event is open to 15-20 everyday chefs who have got the tapas to compete for the title of The Bestest, as voted for by judges and attendees. From dips and spreads to crostini and mini-sandwiches to sushi rolls, mock chicken wings, and beef-less BBQ and beyond, the Vegan Cook-Off is sure to be a bountiful buffet of goodness. Aspiring competitors should check the rules for details on how to apply. But if you just want to be fed and brush elbows with other local veggie seekers, tickets for The Vegan Cook-Off are $12 in advance and $15 at the door day of. Tickets sold out in advance the last time, so we recommend purchasing in advance to avoid missing out! And to wash down all the cruelty-free deliciousness, we'll be providing a list of vegan-friendly beer, wine, and liquor available for purchase. ANNOUNCING THE FIRST NYC VEGAN BAKE-OFF! Ah, mid-February. You’ve finally lost those five pesky holiday pounds. You’ve managed to slip on the ice only once all winter (what ice? what winter?). And now Valentine’s Day is upon us. But the best part? The first-ever NYC Vegan Bake-Off Dessert Competition! Whether you want to indulge in the nutty delights of the very best amateur vegan bakers in town or be the maker of non-GMO goodies (we know you have a super-secret all-natural vegan recipe for dark chocolate brownies that you’re dying to share with the world, right? ), head to The Bell House on Sunday, February 10 for the first Vegan Bake-Off, presented by the skint. The event is open to 15-20 everyday bakers who've got the baked goods to compete for the title of The Bestest, as voted for by judges and attendees. From cookies and mini-cupcakes, to pastries, tarts, brownies, fudges and bars, the Vegan Bake-Off is sure to be a sweet, sweet sugar high. To help crown the earthy crunchiest of them all — and to award prizes — judges Chef Adam Sobel (owner of the insanely-popular Cinnamon Snail Food Truck and Certified Orgasmic), Sarah Gross, organizer of the annual NYC Vegetarian Food Festival and owner of Rescue Chocolate, and whip-smart comedian Myq Kaplan will happily indulge in the day's delicious vegan spread. Just want to be fed and bump elbows with other local vegan-sweet seekers? Tickets for The Vegan Bake-Off are $12 in advance and $15 at the door, day of. Aspiring competitors, check our website for details on how to sign up. And to wash down all the cruelty-free deliciousness, The Bell House will be providing a list of vegan-friendly beer, wine, and liquor available for purchase.